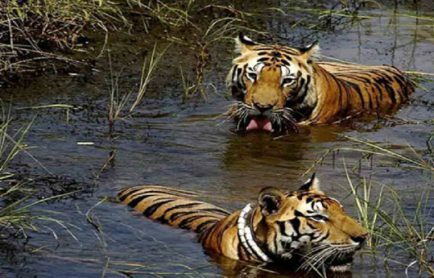 Diverse region of grasslands, temperate forests, ice-clad mountains and dizzying array of animals- the Himalayan Mountains offers world’s most beautiful landscapes and provide shelter to some of the rarest wild animals, reptiles and birds. It is the longest and the highest mountain range that gives home to many endangered species some of which include Snow Leopard, Giant Panda, Red Panda, Himalayan Wild Yak, Himalayan Thar, Musk Dear, Himalayan Marmot, etc. Himalaya embraces the world’s highest peak on Earth i.e. 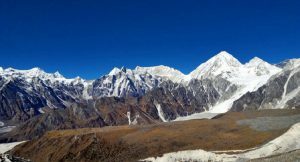 Mount Everest, which is cold throughout the year and therefore the animals here are habituated to the cold climatic conditions. Most of the animals at Himalaya have thick skin and heavy body with phenomenal instinct that helps them protect their lives even in most arctic atmosphere. 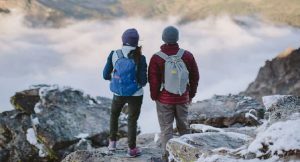 So if you are fascinated with Himalayan wildlife and planning to set off to the great mountains this summer then make this part of information as your handy guide to know the traits of Himalayan animals. Here’s some information about the geographical qualities and biodiversity of Himalayas along with the list of ten outstanding Himalayan animals. As you may have already knows that the Himalayan mountain range is stretch over 1,500 miles and spread across the regions of Nepal and Bhutan, South Tibet, and north of India. These massive ice-mountains were created about 70 million years ago when two continental plates collided, forming the magnificent Himalayan range. These great mountains have four kinds of vegetation naming tropical, subtropical, temperate, and alpine with over 300 species of mammals, close to 1000 species of birds, and hundreds and thousands of reptile, amphibian, and fish species. For a wildlife enthusiast this place is nothing but heaven. However, the sad part is that as many as 163 varieties of animals here are on verge of extinction due to deforestation and global warming. Here’s the list of some of the widely popular Himalayan animals who have successfully mark their presence in the increasingly harsh condition on the mountains. Has this already scared you? Well, Snow Leopard is definitely one of the prime attractions of Himalayan wildlife and a mere thought of facing this BIG CAT in the wild forests can give you goose-bombs. So, here’s what you must know before you face this angry animal. The member of the large cat family and predator of many other animals living in the Himalayas, the Snow Leopard is known for its magnificent appearance and infuriated approach towards its prey. Gifted with beautiful white and yellowish skin, thick fur, and spots of black and brown, this large cat is listed among the endangered animals, the habitat of which is not easily accessible. The Snow Leopard prefers steep, rugged terrains with rocky outcrops and ravines to hide and likes to eat smaller animals when it comes to hunting. 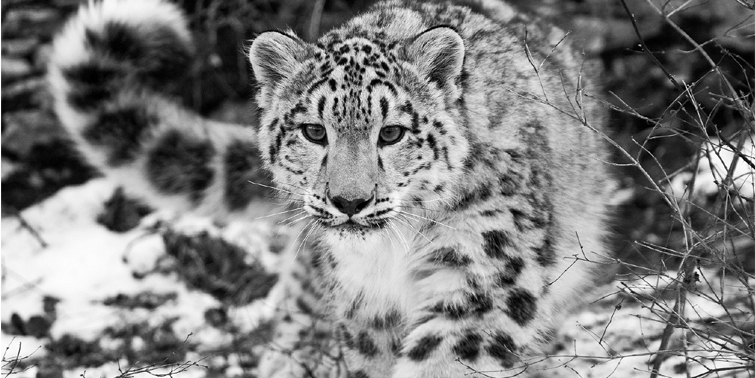 An estimated number of 3,500 to 7,000 snow leopards are left in the wild and you need to be patient to get a glimpse of this otherwise shy animal. Don’t get bemused with the cuteness of this teddy-bear-looking animal! This one is as furious as any other wild animal in Himalayan forests. Marking its presence in the continent of Asia, the giant Pandas can be found in the mountain ranges in Central China, at Sichuan, Shaanxi, and Gansu provinces. This amazing wild creature likes to hide in broadleaf and coniferous forests with dense bamboo trees at an elevation between 5,000 and 10,000 feet. 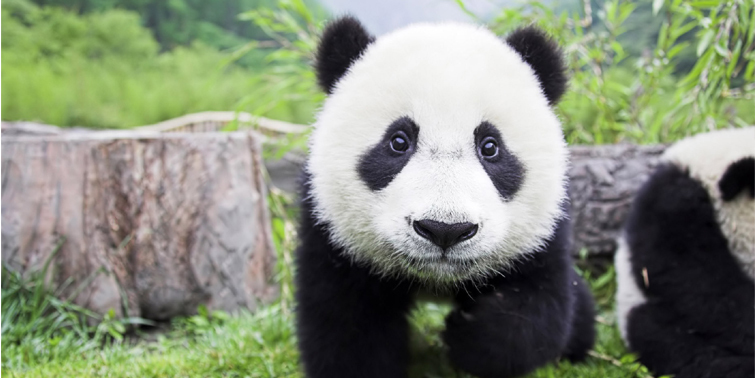 With a body typical of bears, the giant Panda is white and black in color and has black fur especially on ears, eye patches, muzzle, legs, and shoulders. It has thick wooly skin that helps these bear looking animal stays warm even in the coldest atmosphere. Unfortunately, the Giant Panda too is listed as endangered in the World Conservation Union’s (IUCN’s) Red List of Threatened Species. 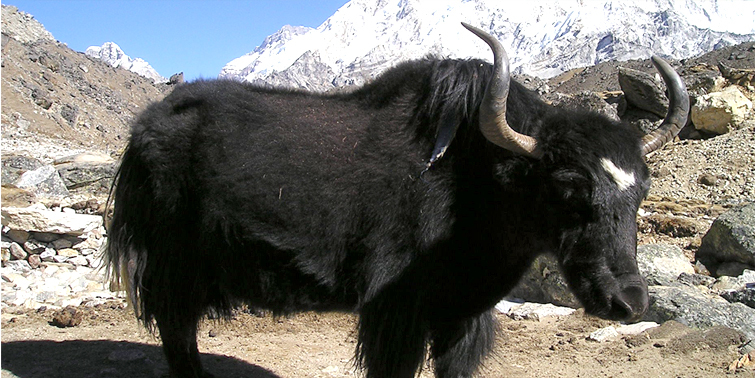 Wild Yak is one of the most popular and widely seen animals found in Himalayan region of India and you can’t get enough of this hairy animal which is considered as domestic by the locals. It is a type of Ox with relatively long hair and massive built with a drooping head that could stand about 6 feet tall at shoulder. Unlike other furious animals in this mountain range, Himalayan Wild Yak is useful as it provides meat, fiber, and milk to the locals. 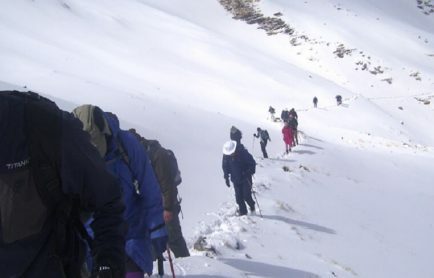 They are also one of the favorites of tourists who often enjoys Yak safari on the hilly regions of Himalayas. Don’t miss the cold desert ride on this massively-built animal. Don’t misunderstand this one with domestic goat! 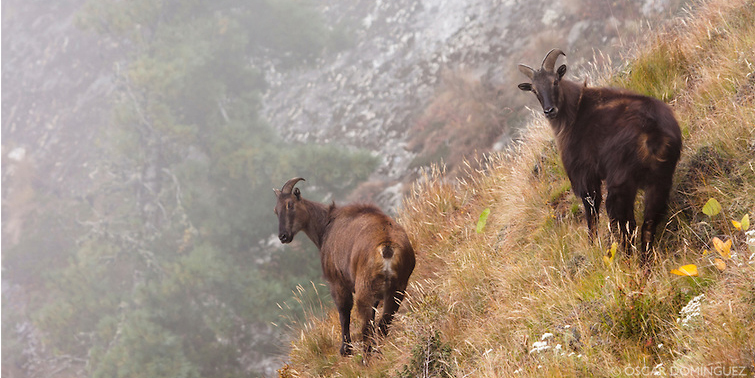 It is yet another habitat of great Himalayan region and is family member of wild goats who lives on rugged wooded hills and mountain slopes. 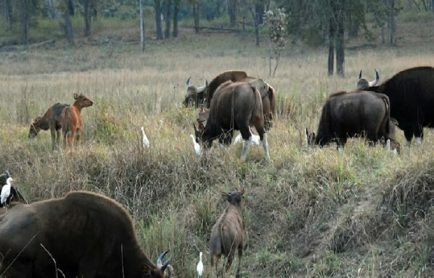 There are three species of Thar found in the cold desert (Himalayas), Thar, Arabian Thar, and Nilgiri Thar and all of these species eat vegetation like grass, herbs, shrubs, leaves, and trees. If you think there isn’t much to witness in this creature then let us tell you that it is one of most beautiful animal which resembles a goat but has longer hair in deep brown and red color. 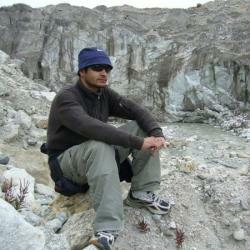 If you are someone who is planning a documentary on Himalayan Wildlife then here is something to pay attention to. The Musk Deer in the Himalayas are of great importance for the perfume manufacturers as the musk found in the scent gland of male deer is used to create perfumes. 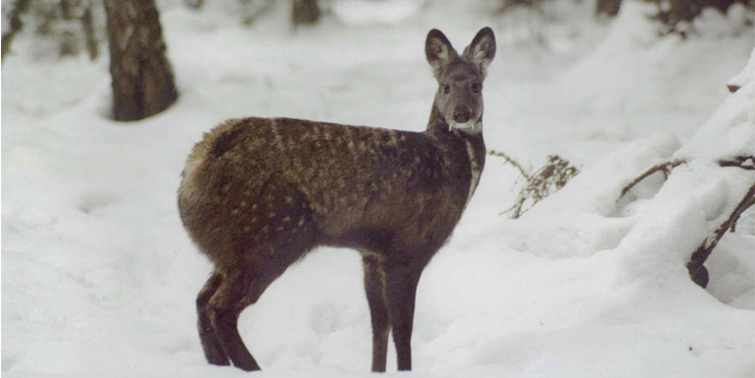 However, this has brought the beautiful Musk deer into the list of endangered Himalayan species. The Himalaya Musk Deer belongs to the family of Moschidae and lives in hilly and forested environments. It likes to eat only leaves, flowers, and grasses. The Indian Musk Deer is highly poached animal and it will be a difficult trek for you to locate this aromatic creature as it likes to stay far from human habitation. Your expedition to the cold desert is incomplete without a glimpse at beautiful Red Panda. 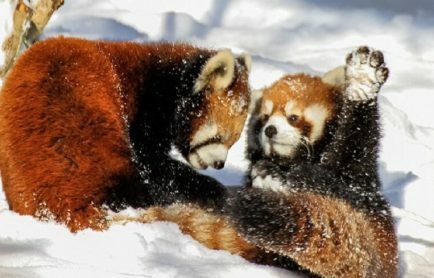 With body of a cat and head of a Panda, this endangered Himalayan species is smaller in size and better known as red fox. This small arboreal mammal is inhabitant of the eastern Himalayas and unlike other mountain animals it likes to live in temperate climates in the midst of deciduous and coniferous forests. They eat many things but fruit, acorns, roots, and eggs are some of the regular food items that Red Panda relish. 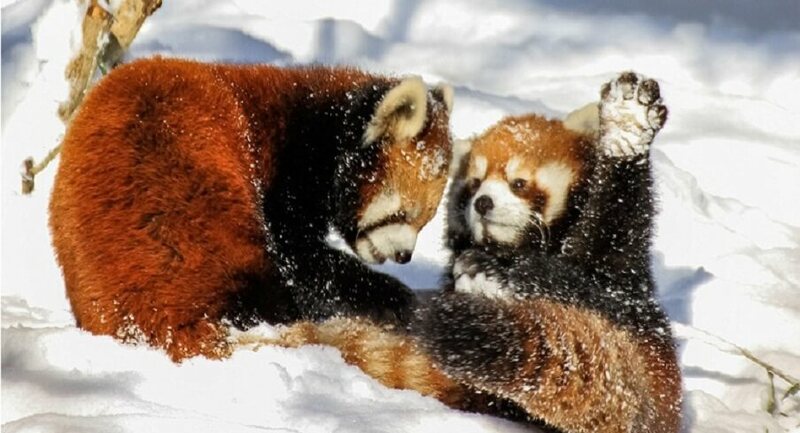 The population of Red Panda is under the threat of extinction due to habitat loss, poaching, and fragmentation. One can find this amazing mammal hung on bamboo or hollow trees as these are considered to be his favorite spot. So, the next time you are part of Himalayan Jungle expedition, try to locate them on bamboo trees. The Himalayan Black Bear also called the Indian Black Bear is a common animal found in the Great Himalayas. 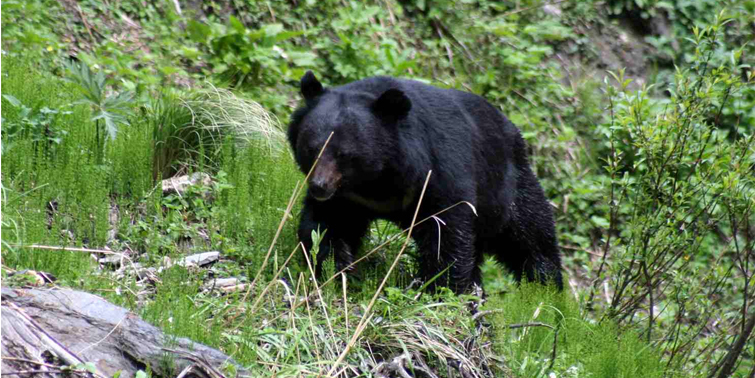 This species is divided into two categories, the Himalayan brown Bear and Himalayan Black Bear, both of which are listed among the vulnerable species. 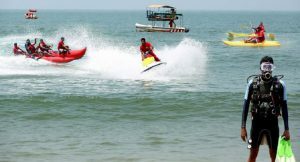 Just in case, you are planning to capture some of its action during your trip, BEWARE! Black Bear are violent towards humans and known to be the most deadly animal of India. They are omnivorous in nature and will eat just about anything, however, their diet mostly include acorns, nuts, fruit, honey, roots, and insects. 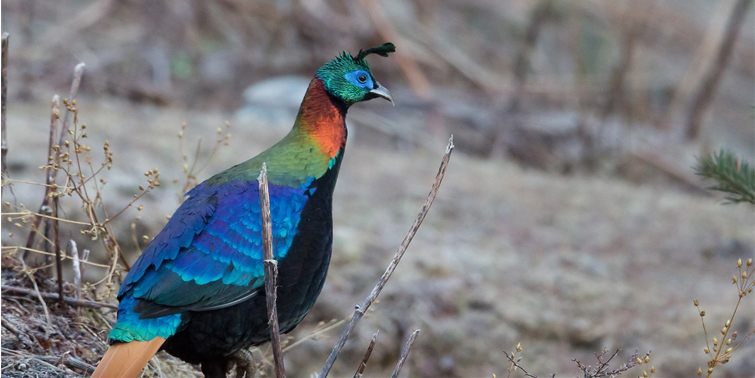 If you are an avid bird lover then Himalayan Monal Pheasant can awestruck you with its vivid appearance. This beautiful bird is gifted with features like metallic green crest, coppery feathers, and prominent white rump and it has so many vibrant patches that enhance its beauty further. The Himalayan Monal is regionally known as Impeyan Monal, Impeyan Pheasant, and Danphe and is also the national bird of Nepal. It is mostly found in regions of eastern Afghanistan, Himalayas in Pakistan, Kashmir, and states of Himachal Pradesh, Uttarakhand, Sikkim, and Arunachal Pradesh. Coming to their diet, well, Monal birds are great diggers and they dig up everything from roots to tubers to insects. Don’t forget to capture these vibrant birds in your magnifying lenses the next time you are holidaying in mountain range. 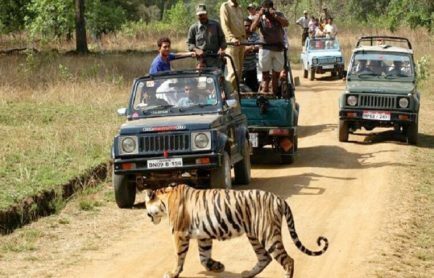 This one is yet another delight in your wildlife tour! 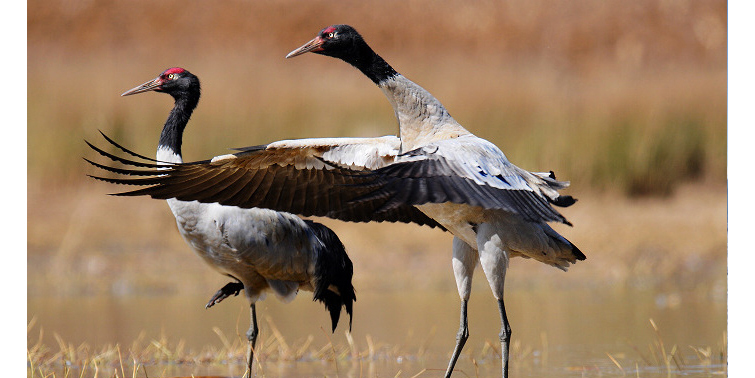 The black Necked Tibetan Crane as the name suggest has upper part of the neck and head black, except for a small white patch next to eyes and red bald patch between the eyes. This medium-sized crane is found in parts of Tibetan Plateau during summers and in remote parts of India and Bhutan during winters. Tourists are advised to plan their trip to great mountains during winters as these birds look their best during this time of the year. Black Necked Tibetan Crane is the only Alpine Crane present in the world and they use barley and wheat fields to arrange their food during summers. Don’t be scared of this cute little mammal, this wondrous creature is quite social in approach and likes to live in colonies of varying sizes. Found in the Himalayan regions of India, Nepal, and Pakistan, Marmot is one of the highest elevation-dwelling mammals in the world which is habitual of living in dry alpine meadows with little rainfall around. 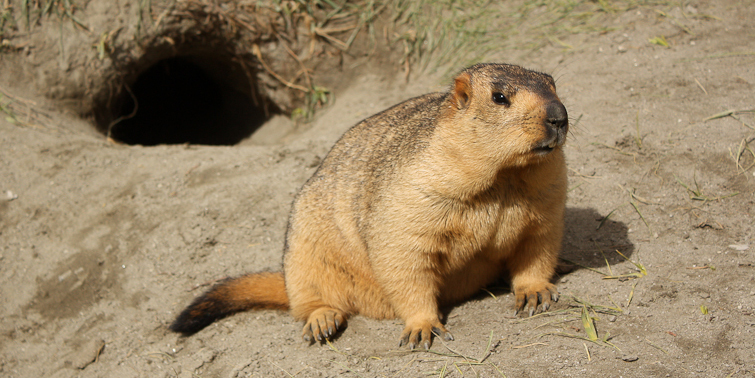 Though tiny in contrast to other ground animals, but Himalayan Marmot are referred to as large ground squirrels which is similar in size to an average house cat. They are herbivores in nature and prefer flowering plants such as leaves, roots, tubers, seeds, grains, nuts, and fruits. So, these are some of the amazing animals that the massive cold mountains of the Great Himalayan range embrace! 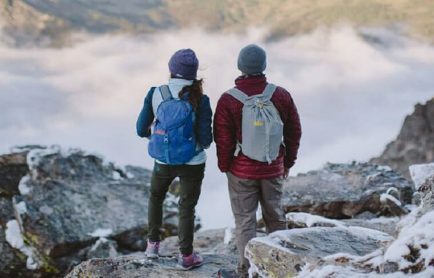 Yes, I know the list is quite exciting and it has driven you completely but wait, the best time to visit Himalayas is from March to June and September to November.